Before winter hits and an outdoor workout is more of a chore than a joy (yes there are some committed runners and others who workout straight through the winter – I know, I’ve seen them while driving by on my way to the gym), here are some fun ways you can squeeze in some outdoor workouts. 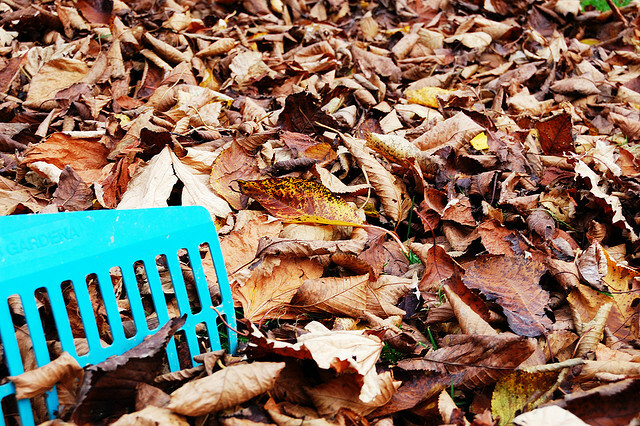 Raking leaves is a fantastic upper-body workout that will burn about 270 calories per hour depending on how fast you work. While raking be sure to change your movements and the direction your raking in to get an even better workout. Hold the rake in front of your body to give your shoulders a good workout. Rake from right to left and then switch and rake from left to right to work both arms. Rake the leaves into a pile and do some running jumps into the pile. Tip: this only works if you’re doing it with kids Be sure to bag up the leaves and carry them away to work your muscles and burn more calories. Get together with some friends or the spouse and kiddos and head outdoors for a fun game of touch or flag football and you’ll burn more than 500 calories in an hour and have lots more fun than spending that same hour on the treadmill at the gym. If you have a wood burning fireplace, a fire pit or a beach nearby you can burn 300 calories per hour chopping wood. Visiting a pumpkin farm is a fun fall activity for kids AND grownups. So if you don’t have any young kids grab some friends or the older kids and head on out for an afternoon of pumpkin picking. While you’re searching for just the perfect pumpkin or pumpkins you’ll be adding steps into your day, so say no to the hay ride to and hike from the parking lot to the pumpkin patch. Amp up your pumpkin workout by carrying your pumpkin as far as you can. Be sure to keep the pumpkin as close to your body as possible and always squat down (don’t bend from the waist) to pick one up or set it down for a break. You’ll rack up 175 calories per hour tromping through the pumpkin patch and 135 calories when carrying your pumpkin for 30 minutes. After your pumpkin workout you can continue the activities by trekking through a corn maze. The corn maze will burn 150 to 200 calories per hour. Picking apples and carrying your bootie back to your car will rack up 200 calories per hour. If the farm has a manual cider mill, crank your apples into mush for cider later. You can ride solo or coral the gang together for a trail ride. Horseback riding is not only a blast, but it also uses muscles you’re not accustomed to working with and burns 470 calories per hour. I know! I couldn’t believe it either. The horse does the work, while you sit there and you’re still burning calories! Well obviously that’s not entirely true, but it sure feels that way. Uneven terrain and any hills you encounter on the trail will force your body to work harder than if you were walking on a flat surface. You’ll be working your leg and core muscles to adjust to the terrain and challenging your balance which is one part of the exercise regime that we often forget to engage. All this translates to a bigger calorie burn than walking alone. You’ll be walking off 400 to 500 calories per hour depending on the terrain and your walking speed. Plus when you’re paying attention to the scenery, sounds and scents along the trail you’ll forget you’re actually getting in a workout! You’re sure to find a race you can run or walk almost every weekend this autumn, especially with Halloween races and Thanksgiving Day events on most community calendars – or just do a Google search. Check out SparkPeople’s free 5K training programs and free 10K training programs to get started, or join a local running group to train for an upcoming race in your area. You’ll burn 450 to 650 calories per hour while training and on race day. Walk through a haunted house and you’ll burn 75 calories in thirty minutes. Run and you’ll burn 125 calories in 30 minutes. So get out and get fit, keep fit, and just enjoy the fall season while working towards your health and weight loss goals. It is possible to keep fit despite the demands of parenthood. Having a child does not have to tether you to crib and playpen; as long as you’re willing to be flexible and use your imagination. You might have to change the way you do things but you won’t have to cut a fit lifestyle completely out of your life. Trade babysitting time with a friend and use your time to workout at the gym. Use a jogging stroller to slip in a morning jog. Attach a baby trailer to your bicycle. Workout to an exercise video while your baby plays on the floor or in a playpen. You won’t fail to amuse him/her. With a toddler around, the world is your gym. Consider the following venues and then apply the same strategies to other places you frequent and activities you perform with your toddler. Playground: While your toddler is tackling the slide you can be doing chin ups on the jungle gym. While the little one is playing in the sandbox you can power-walk or jog the perimeter of the area. Take a set of handheld weights and do strength training while watching (you know the refrain – “watch me”, watch me!” “WATCH ME!!!”). Home: They’ll get on the floor right along with you and make entertaining attempts to imitate your workout routine. Likewise they’ll dance along as you follow your favorite aerobic video. Just like at the playground, jog around the back yard while keeping an eye on him/her, or do the toning or strength training you were too embarrassed to do at the playground. When they want me to “watch” I find that the perfect time to do aerobics while watching them skate, dance, practice baseball, etc. To succeed in any type of sport you need to train yourself systematically. It doesn’t matter whether you’re training for a race, a competition or just for your own personal benefit – to see how far you’ve come you should keep a training diary. Documenting your progress not only helps you with short-term planning but it also allows you to see your development over a long period of time. You’ll be able to determine which exercises were the most effective and which ones you can eliminate from your routine. To ensure that you exercise regularly it helps if you’re having fun, not only with the activity but also with the upkeep of your training diary. It shouldn’t feel like just one more thing you don’t really want to do. Picking a pretty or very cool looking notebook can help to make you smile when you whip out your training diary or if you’re a gadget-gal or guy finding a training app or software can help you to look forward to making your training entries. Cardio, basic or speed training? Should you have a different exercise focus then it can easily be incorporated into your diary. Cyclists for instance often also keep track of their pulse in the mornings before they start their workout. That makes sense to prevent overtraining yourself. Having a faster pulse during your resting period can indicate a number of things, you could be asking too much of yourself when exercising or you could be in danger of cardiac arrest, which is a serious risk for any endurance athlete. Thank you to Festina for this post. Festina has a range of cycling watches chock full of useful features to help you keep your training diary up to date and help you stay healthy. You can find a range of Festina watches over at Watch Depot. We’ve recently discovered roller skating and inline skating here at the UnDiet and are having a blast using it as a new form of cardio, so when a reader asked to submit an article on the benefits of roller skating we said “sure, have at it”. Roller skating has lost its thrill as a pastime. People roller skate for fun group activities or dates, but few people roller skate for leisure, transportation, or even exercise. Its perception as being “out of date” overshadows the many benefits of roller skating. What Benefits Does Roller Skating Have? The major benefit of roller skating is exercise! Roller skating gives you anequivalentworkout to jogging or even biking! It is primarily an aerobic workout that targets almost all of the body’s muscles including: the heart, arms, quads, glutes, abs, you name it. Because it’s an aerobic workout you can burn many calories depending the speed and effort that you put into; however, on average, if you spend an hour just skating at a moderate pace, you can burn about 330 calories. The best part about it is that it causes 50% less impact on your joints than running! No more achy knees! Why Choose Roller Skating For Exercise? It’s fun! If running sounds like extreme boredom, roller skating might be your thing. If you choose to roller skate at a rink you can enjoy the music, people, and lights. What can be more fun than that? Or you can skate along a path at a park, down the sidewalks in the city – anywhere that provides a paved surface. Make it even more fun by making a game out of it; invite other people to play a game of tag, start a race, or just enjoy the company. The great part about exercise is it boosts your mood and your energy, so even if it doesn’t sound all that great to start with, you’ll be loving it by the time you finish. With roller skating, the cardio aspect of exercise is all taken care of, so if you’re looking for a way to increase your strength, check out these options at www.homegymreview.net. Whatever you choose, you’ll be loving your new lifestyle that will make you look and feel great. It doesn’t seem quite fair that in the mix of the eight-eight-eight breakdown of a day —eight hours of work, eight hours of sleep (ideally) and eight hours of downtime — we have to spend one of those precious downtime hours at the office. Yet your lunch hour, properly spent, can go a long way toward rejuvenating you, making you happier and more productive for the rest of the day and even propel you along towards your weight loss goal. 1. Get moving! Taking a walk during your lunch hour is probably the best way to recharge yourself. Walking helps you relax, burns calories, and releases energy in your body that makes it hard to sit still during the workday. Better yet, snap on a pedometer and track your steps throughout the day. Challenge yourself to get at least 10,000 steps a day. 2. Go to the park. If there’s a park near your office, spending some time in nature can be amazingly rejuvenating. Watching the squirrels and birds is relaxing, and breathing in the natural scents helps you breathe more deeply and melts away stress. 3. Do yoga. Find an empty conference room — or better yet, head to that park —and pull out your yoga mat. Yoga helps you relax and refocus your brain so that you can make it through the afternoon. 4. Plan ahead. With everything we have to get done on a daily basis, meal preparation can seem next to impossible – especially a healthy meal. Rather than checking Facebook or reading the latest celeb gossip during your lunch hour, write out the meals you will prepare throughout the week. Better yet, write out your grocery list as well so that you can hit the market on the way home – and so that you won’t be sidetracked by junk food. 5. Make a call and hit the road. Make a pact with a friend or family member that you’ll have walking calls over lunch. Use this time constructively: talk through work, family or personal issues – but be sure to discuss solutions, too. Doing so will nip stress in the bud, and will leave you with a game plan for moving forward. By walking while you talk, you’ll burn calories and knock out at least 30 minutes of exercise. Now that’s what you call a “Power Lunch”! Whether your office feels oppressive or it’s the best thing in your life, we all need an escape from time to time. Take that escape daily during your lunch hour, and you’ll enjoy your job more. As an added benefit, shifting attention away from work in the middle of the day frees your brain to come up with creative solutions to problems that have been bugging you, so when you come back to work, you’ll be refreshed and ready to tackle what’s left of the day. Not to mention – you’ll burn some calories, too! Tina Daniels writes about self-improvement for Vape World. A Personal Review For The Stamina 55-1610 InMotion E1000 Elliptical Trainer! UnDiet: Thank you to one of our readers for this detailed review of what looks to be a great piece of home gym equipment. I like this small so-called elliptical! Having tried a mini-stepper before, I found the Stamina Inmotion E1000 to greatly surpass the workout quality. Putting it together was a breeze. I normally use it while I am watching TV and you can easily transport it from one place to another. Before I purchased this elliptical, I used to eat food while watching TV which is unhealthy. Now I’ve effectively swapped that habit by exercising on the Stamina E1000 elliptical machine. The advantages are tremendous! Reviewers have stated how compact the stride is in comparison to the fitness-center elliptical machines. This is quite true actually; however I don’t feel this is as a bad thing as the motion is extremely nice! The E1000 Elliptical Trainer can easily get my heartbeat up or assist me in breaking a sweat. The best thing is that this elliptical completely hits the core areas as there are no handles to lean on. Due to the lack of handles, one is forced to stand upright which in turn works the core muscles. My abs are always sore the next day if I am completely focused on my position during workout. I sometimes carry small weights to workout my arms during cardio on this machine. That’s an additional advantage of having both hands free. The Stamina 55 E1000 trainer also counts steps and miles walked. My only real minor complaint is that it stops and starts over after 9999 steps rather than counting ahead. Nevertheless it does remember your steps and miles walked from a while back like a week ago or last 2 days! It’s an excellent elliptical as its cheap, small and less expensive in comparison to regular elliptical machines. Even if it only lasts a few years, I possibly could buy a replacement but still wouldn’t be anywhere near to the cost of a regular elliptical! I made use of the free Super Saver delivery to have mine shipped through Amazon and now I get a great workout several times a week within the confines of my very own house which saves me the troubles of having to pay at a gym and drive there just to get a decent workout!! Whether your aching hip is caused by a pinched nerve or a fracture on the pelvic bone, you can do one or more quick and easy tips to ease the pain and other symptoms you might get like a dull throbbing or a numb sensation. Try the five tips below to get relief from pain and help your hip get back to perfect condition again. 1. Get off your feet. You may think it’s strange to rest your feet when it’s your hip that’s aching, but actually walking and moving around requires hip movement, and any unnecessary motion can bring a fresh burst of pain. Mild cases of hip pain can get better after a few hours of rest, while severe injuries may need a couple of weeks or more. 2. Lie on your back when resting and sleeping. Hip pain can get worse if you put too much of your body’s weight on it, so refrain from lying on your side or on your stomach, both of which puts more pressure on the hips. Lying on your back is actually the best position, not just for hip injuries but also for leg and foot problems or even a pinched nerve upper back. Although you are required to get enough rest to let your hip heal, you will still need to do the right exercises to speed up recovery by conditioning your hip muscles and stimulating good blood circulation. Moves like kicks and twists should be avoided. Instead look for routines that will strengthen without being repetitive, such as Pilates and Yoga. Exercises for pinched nerve in hip also focus on correct posture and won’t subject you to high impact, so go for stretches over repetitive moves to treat hip pain. 4. Use ice wraps and cold packs. This is the best step for getting instant pain relief for the hip. An ice wrap can soothe the pain signals released by the sensory nerves and decrease swelling. Ice packs made with ice cubes and a towel or Ziploc bag is also as effective but may be more difficult to keep steady on the hip than an ice wrap. 5. Gently massage the hip area. A hard massage can be too painful for an aching hip, so use light gentle strokes with your fingers and palms instead. A soft touch can be far more calming than strong pressure, so relax and keep your strokes light when massaging your hip.